Naturally sourced and formulated especially for women to support working memory and cognitive functioning as well as help maintain cholesterol and cardiometabolic health. 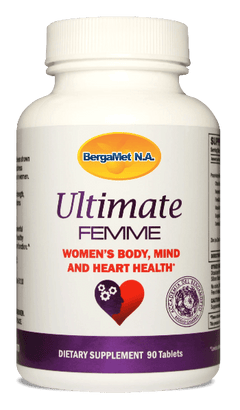 The ingredients in Ultimate FEMME have been shown to support cardiometabolic health and address hormonal imbalance and cognitive issues in women. They may enhance energy levels, moods, strength, vitality, and diminish some adverse symptoms related to female middle age. In addition, Ultimate FEMME contains powerful antioxidant flavonoids that may support healthy cholesterol, blood glucose levels, and liver function. The health benefits of the bergamot fruit come from its unique profile of phenolic compounds, such as neoeriocitrin, neohesperidin, naringin, rutin, neodesmin, rhoifolin and poncirin. Naringin has been shown to assist in maintaining normal inflammatory balance, while neoeriocitrin and rutin have been found to exhibit a strong capacity for quenching free radicals and maintaining healthy LDL cholesterol levels.